This recipe is anything but fishy. 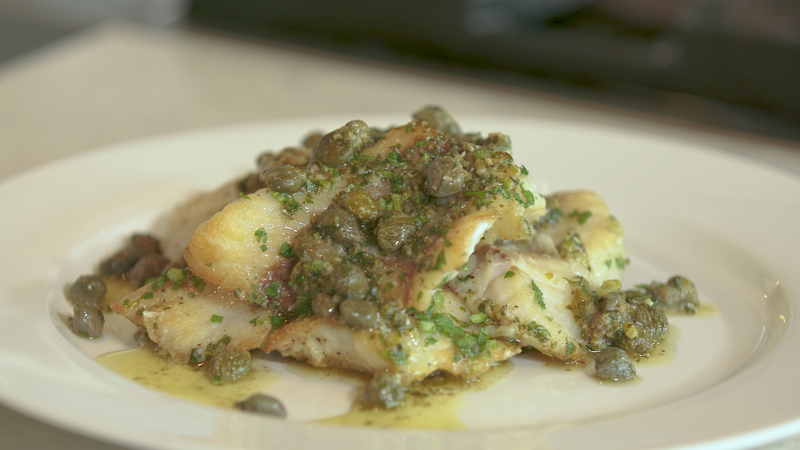 Dan shows us how to make a fish dish in a way that’s super fresh, super simple and super fancy (like the French do). • Lightly dredge the turbot fillets in all purpose flour, then place them into a frying pan pre-heated to medium-high heat with a little canola in the pan. • Season the fillets with salt and black pepper. • After 45 seconds, flip the turbot to the other side and brown on second side. • Add 1 tablespoon capers, 2 tablespoons butter, and let the butter melt. Squeeze in the juice of half a lemon, and then add in finely chopped parsley (about 3 tablespoons). • Continue to cook for about 1 minute, until flavours are combined. • Remove from heat and serve immediately. • Arrange fish neatly on platter and spoon the remaining butter sauce overtop.